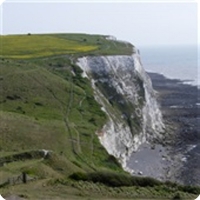 Halling Chalk Pit is designated as a RIGS because it provides access, in the Medway Valley, to a key interval (the Plenus Marls) infrequently exposed between the Kent coast and outcrops north of the Thames. Halling Chalk Pit is part of a network of Chalk RIGS in the Medway Valley. This huge, somewhat overgrown pit is situated to the west of Halling village and exposes the upper part of the Lower Chalk and the lower part of the Middle Chalk. 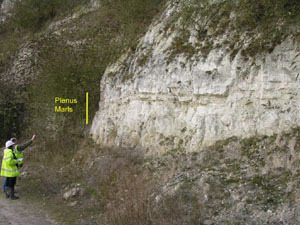 The RIGS focuses on the Plenus Marls at the top of the Lower Chalk. At the designated section, Grey Chalk below the Plenus Marls is fossiliferous with small brachiopods and corals. The Plenus Marls have been divided into eight thin beds that can be traced throughout the Anglo-Paris basin. At Halling the oldest bed (bed 1) is missing and bed 2 lies on an erosion surface cut into the Grey Chalk. Burrows, reaching down 50cms from the erosion surface into this underlying chalk, Beds 3-8, are present. This contrasts with Peter's Pit, on the other side of the Medway, where all eight beds are present. The Melbourne Rock, a hard nodular chalk overlies the Marls and marks the base of the Middle Chalk. 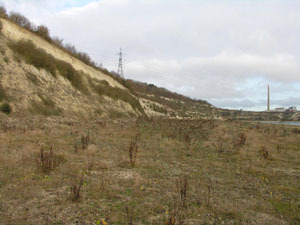 Halling Chalk Pit was surveyed for designation as a RIGS in December 2005. Permission to visit must be obtained from the owners. Parking is at the cement works and visitors are escorted. The quarry faces are vertical and hence there is the risk of falling debris but the faces are relatively low, mature and stable. The quarry floor is uneven under foot.